Those who have read my other blog posts will know I’ve never been a ‘big announcement’ person on Facebook! 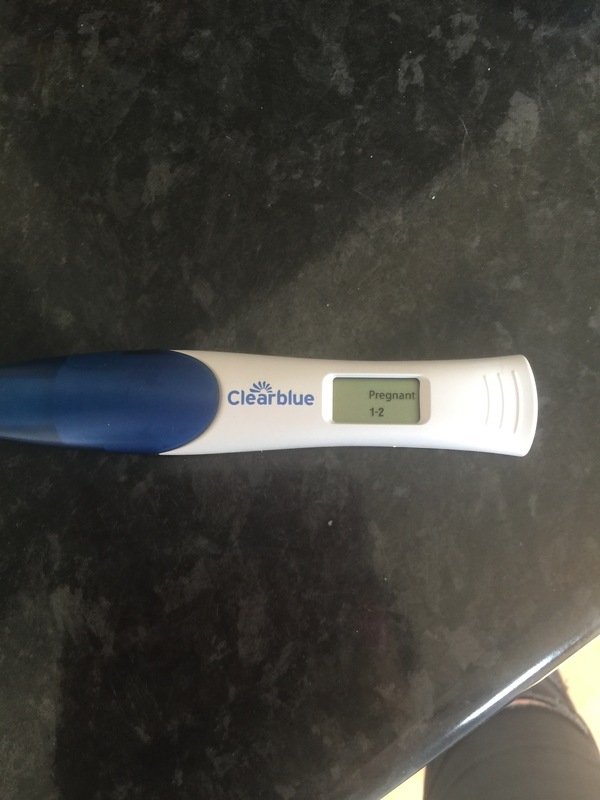 When I found out I was pregnant this time I never thought a few months later I would have started this blog and have announced it in such a way! When those 2 lines came up on the test I was shocked, happy, overwhelmed all at the same time! I know how incredibly lucky Scott and I were to be able to get pregnant so quickly – we decided we would try and if it happened it would be a bonus but if it didn’t it would when my body was ready after all I had only had a baby a few months previously (normally this would be the last thing on your mind, getting pregnant again) but for us it was all we could think about. After a few days at home after we left Betty in the hospital I said to Scott I want another baby, I had already decided in my mind I didn’t want to wait too long, he felt the same. It felt right and wrong all at the same time. Before Betty in 2013 I had a miscarriage, after that having a baby was the last thing we wanted it shocked us so much, we weren’t expecting it, we just couldn’t think about another. And as a result waited several years before trying for the baby that was Betty! I’m not saying that we weren’t shocked when this happened, we couldn’t have been more shocked to the core, but it was different this time. The seat was in the car, her clothes were washed and in the wardobe, the nappies and wipes were ready in a basket, her Moses basket was by our bed. We came home with no baby just a box with some keepsakes of her and a house full of reminders of the excitement we left just several nights before when we left to go and have our baby. I can honestly say this is literally the worst thing we have ever experienced, I pray we will never feel or go through something as devastating in our lifetime (of course we don’t know we may) but coming home to an empty house with all the war wounds of child birth but no baby laid in your arms to make it feel worth while was just mind numbing. I went to bed. I never wanted to get up. But I had to. So going back to those 2 lines. We were going to be starting this journey again so soon after going through it with Betty. It was going to be so different this time. To begin with I felt guilty, I worried people would think I was wrong to be having another baby so soon (why was I worried about what they thought?) maybe that’s just me! This baby was/is NEVER going to replace our baby girl but we were ready for her – our family had a space for one more, we need the fourth member of our ‘gang’ as we like to call it. We had to try again. Perhaps this baby could help to heal our broken hearts, fill a quiet house, after all we were prepared with all the kit a baby could ever need! All Betty’s things went back in the loft – the hospital bag still packed, I sorted nothing it just needed to go away. I said if we ever had another baby I wouldn’t get anything out until they were here – but as time is progressing this time I am trying to change my attitude to this. I don’t want to not think about this baby so much that it’s almost a shock when it arrives. We can’t go through the pregnancy in fear. We have to embrace Mother Nature, we have been given the gift now and we have to have hope and faith they will arrive safely and come home with us. After all the hospital will look after me so well this time, they don’t want it to happen again! Of course it could, we are now a statistic, once it’s happened to you once you are more at risk. But I am NOT going to make myself go crazy with that thought. Which is why this time, for the first time I am doing things differently, I havn’t had any counselling yet but in my own mind this is a sort of therapy for me. As well as my blog, this time I am going to set up the nursery, we actually didn’t even do that with Betty (we were going to wait until she went in her own room around 6 months) but this time we will put the cot up, get all the things we put in the loft back down, wash them, get them ready as we did before with all the hope of bringing any new addition to your family. This time I will put things about being pregnant on my blog, I will write about it, because it’s a big part of our life right now. It would be strange for me to not do it. Everyone’s support and messages of encouragement, sadness and love will get me through. I never thought 7 months ago when I sat in the same spot on my sofa where I am now, that I could feel like life was getting better. Back then, even tho it wasn’t that long ago I thought I would never feel normal again, never have the feeling of hope or excitement and more importantly, happiness. And even if I wasn’t pregnant again right now, I would still have those feelings right now at this moment in time. I have a lot to be happy and grateful for and also a lot to be sad and unhappy for but I will not let the latter get the better of me. It is the hand we have been dealt, it is life, we have to keep living it. After all what is the other option? If someone had said that to me months ago I would probably have wanted to punch them in the face! Hee hee! But now I can say it, I know it’s true. It’s hard to hear sometimes but its true. So for now until anything changes I am not going to think differently, I am going to try and remain focused and positive. Of course there will be days when I don’t feel happy or confident that it will be ok – but I will get through those days as I have been and take them one step at a time. For like everything in life that’s all we can do. But there is a rainbow in sight and I’m am not the type of person that will give up without a fight and believe me I am fighting so hard right now. I didn’t believe the first 10 cheapy tests I did so I went and got an expensive one just to make sure!! !